Your prayers for begetting a child are answered upon performing the Santhana Gopala Homam. This Fire Lab protects the expectant mother against miscarriages and ensures safe delivery of the baby, as well. The vibrant Homam. 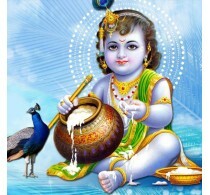 would bless the couple with children, good health and prosperity Santana Gopala pooja plays a key role in removing the karmic issues and doshas in a horoscope. In addition, it provides methods for recovering from malefic effects of planets in a birth chart. · This pooja is a suitable one for improving health conditions of a child by reducing complications. Anyone who wants to live a peaceful life with their partner can choose this pooja for getting desired outcomes. Benefits of Santana Gopala Pooja · Santana Gopala Pooja is a suitable for getting powerful energies on the body for conceiving a child in faster methods. Furthermore, this pooja plays a key role in increasing the intelligence levels of a child to a larger extent. Another advantage is that it helps to live a happy and prosperous life. Your prayers for begetting a child are answered upon performing the Santhana Gopala Homa..